Ranking episodes of The Sopranos with any sort of authority is an appropriately Sisyphean task. No matter what decisions Tony makes, or how many chances he has to rectify them and redeem himself, he is doomed to remain deeply unhappy. The nature of his work prevents it. This list will fail likewise. So instead of fixating on the episodes that haven’t made the list, let’s appreciate the ones that have. “I hate my life, being a Soprano.” Meadow’s complaint is directed at Christopher (whose neck brace never stops looking hysterically undignified) after he and Adriana abduct her for interrogation after school. Not routine, per se, but not altogether surprising. There’s no question that being a Soprano entails a certain amount of tragedy, but this episode deals with the baffling and unintended consequences. When AJ gets into a fight and the other boy forfeits, his victory is sullied by a bystander’s comment. The kid sarcastically implies that something other than AJ’s ferocity intimidated his adversary. When Tony is on his way to Dr. Melfi’s office and sees Sil in the building, he’s immediately paranoid that they are meeting about him. Tony sees an acquaintance at a plant nursery and invites him to a BBQ. The man is the father of the boy AJ almost fought and Tony is carrying an axe. The man scurries off, nearly running away, to Tony’s confusion. Even in light of Tony’s egregious sins, you still have sympathy for the fact that his family has sacrificed any semblance of normal life. They can’t get into a schoolyard fight, attend therapy, act friendly, or get into Adriana’s car without experiencing unpleasant and inadvertent reactions. AJ’s consternation over the forfeited fight prompts him to ask Meadow about their family. He spends the rest of the episode processing what she reveals to him. The burden he’s faced with is unenviable for anyone, let alone a kid. The final scene in which AJ watches the FBI watch and photograph Tony and his associates is someone realizing they live a cursed life. 9. Season 2 Episode 9 "From Where To Eternity"
Like “Pine Barrens,” this episode is a great character contrast between Paulie and Christopher. Christopher fights for his life and is clinically dead for one minute. When he comes to, he tells Paulie and Tony that he saw hell and that they are all going there when they die. Tony dismisses it as morphine nonsense and when he retells the incident to Carmela, he substitutes Hell for Heaven. Paulie refuses to accept that he’s going to hell and tells Christopher it’s purgatory. Paulie calculates the thousands of years he’d have to spend in purgatory and says it’s no sweat in relation to eternity. But after he sees a medium who confirms he’s going to hell, Paulie gets angry. He goes to his priest and demands to know why his donations haven’t guaranteed his entrance to heaven. Paulie’s attempts to bargain his way into heaven is perhaps the best microcosm of his character. On the opposite end of the spectrum, Christopher is devastated and terrified because he knows he deserves Hell. He never gets over the revelation: during the season Chrissy says, “That’s the guy, Adriana. My Uncle Tony. The guy I’m going to hell for.” Tony falls into the Paulie camp— they’re comparably deluded. When Tony is talking about Hell to Dr. Melfi he expresses confidence that he’s going to heaven and Hell is only for Hitlers and pedophiles. While all three men have varied levels of guilty consciences, the only one honest enough to admit that Hell is his final destination is Christopher. 8. Season 1 Episode 5 "College"
“College” is consistently on best episodes lists because of its incredible quality. There are a hundred things to pinpoint as strengths so I’ve narrowed it down to one theme that is especially resonant: false starts. Carmela gives her first "real" confession in twenty years, admitting her complicity in Tony’s "business." The confession feels authentic—but we all know it ends up being lip service. Tony admits to Meadow that some of his income comes from illegal activities. Meadow appreciates that he’s honest with her for the first time. The unprecedented honesty in their relationship is hopeful, and devilishly misleading. In season one, Tony is set up as an anti-hero figure. Flashes of honesty and moments of self-reflection (such as the one inspired by the Hawthorne quotation) give a sense of Tony’s guilty conscience. But as the series progresses, he becomes unquestionably villainous. As far as Tony is concerned, The Sopranos does not traffic in redemption. Half-assed self-reckoning is used as a red herring to drive home the audience’s disappointment when Tony proves to be irredeemable. “College” is one of the earliest episodes where we see Tony and Carmela acknowledge the moral despicability their lives are founded on—an exercise they engage in sporadically—and their soul searching seems genuine. When watching the series for the second time, these flickers of hope take on an even more layered disillusionment. Tony meets his dad’s old girlfriend, Fran, at his parents’ gravesite. He takes a liking to her and befriends her. J.T., Christopher’s friend from rehab, mentions that he’s gotten into gambling and Chris offers to set him up at a high stakes game. These are fairly innocuous situations, but introduce someone of Tony or Christopher’s character and they become opportunities for exploitation. What’s frightening is how these two men are powerless to control their impulses to manipulate people. Tony’s worship of his dad is fed by Fran’s stories and he uses her as a way to be close to his late father. While she may not be an exemplary person, Tony’s affection for her is entirely conditional on her ability to make him feel like he is doing something his dad would have appreciated. She has no value to him in and of herself. On top of it, Tony uses the "happy" relationship Fran and his father had as justification for his own extramarital affairs. Chris, through a series of events related to the high stakes poker game, drives J.T. to use heroin again. Tony and Christopher’s instinct to exploit people is loathsome, but it’s also pitiable. It’s as if there is an invisible hand destruction that guides them to implode any good thing that comes into their lives. In the flashback with Tony’s father, it becomes clear where Tony’s impulse to exploit comes from. While his father was with Fran, Tony’s mother went to the hospital and miscarried. Tony is forced to lie to his mother and say that he and his father were at a Yankees game. The tragedy is that Tony felt awful and knew his father’s behavior was abhorrent but emulates him anyway. Is this the funniest episode in the series? It might be. “Pine Barrens” was nominated for an Emmy and it should have won. As Tony deals with an increasingly psychotic Gloria, Paulie and Christopher botch a simple task in the worst way possible. Their incompetence, the focal point of the episode, knows no bounds. How Paulie ever became a captain is baffling and this episode is an inventory of his shortcomings. After inciting the Russian, failing to kill him, and convincing Christopher that his four years in the army will lead them back to the car, Paulie gets them hopelessly lost. As Christopher’s head is bleeding, Paulie throws him under the bus and lies to Tony, saying that the predicament was Christopher’s fault. They seek shelter in a van where things begin to get uneasy, manic, and hysterical. Writers could have gone in the direction of saying one thing on the surface while an undercurrent of possibly deadly tension (think Avon and Stringer on the rooftop discussing their childhood) moves beneath. But when Chrissy accuses Paulie of planning to strangle him and then holds a gun up to Paulie’s neck, it never veers into truly sinister territory. This episode made an important distinction clear to me: while Chris is unstable, Paulie leans toward unhinged. The distinction is predicated on the fact that Chris can be stupid, but Paulie is stupid. Retribution. 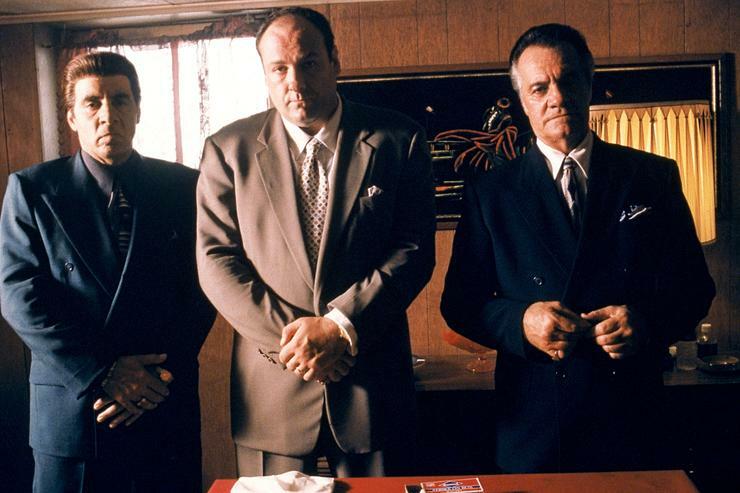 I could write a thesis on The Sopranos as a modern-day Oresteia. The lesson is the same: violence begets violence. Ralphie murders a stripper and Pie-O-My. Tony kills Ralphie. I’ve always wondered if Ralphie could have saved himself. Tony was basically certain that Ralphie killed Pie-O-My, but he was not without a shadow of a doubt and needed confirmation. The things is, if Ralphie had lived, his life would have been ruled by threat and suspicion. The title “Whoever Did This”, taken from Tony’s implicit threat, reverberates with menace. Menace is Tony’s most valuable tool and one he wields all too expertly. The dismemberment and draining of Ralphie in his own bathtub is one of the most enduring images of the series. While some episodes tend toward the cerebral, relying on dreams and counseling sessions, “Whoever Did This” is firmly rooted in the corporeal. The choreography of the fight and subsequent murder in Ralphie’s kitchen is disgustingly realistic. The scene where Ralphie’s son is punctured with the arrow reinforces my opinion that the most brutal scenes of violence in the series are the ones that don’t use guns. I will never be able to look at a bowling ball bag and not imagine Ralphie’s head inside of it. 4. Season 6 Episode 3 "Join The Club"
There are tinges of It’s a Wonderful Life in this episode that follows Tony’s dream alter ego. While in a coma, Tony becomes Kevin Finnerty—traveling heating system salesman. In theory, as ‘Kevin’ Tony gets to experience a life that is not enmeshed in and reliant on violence. The conceit is great. It’s in keeping with the series’ historical usage of dream sequences and Tony’s agency as Kevin grants viewers insight into the decisions he would make if he were free from the duress of his lifestyle. Funnily, what this episode illuminates is that given the opportunity to make decisions as a regular civilian, Tony makes the same mistakes. The scrap Kevin/Tony gets in with the monks at the hotel touches on an idea of the immutable self. "Join the Club” is an anti-It’s a Wonderful Life, wherein Tony is powerless to manifest a different path. Christopher sits on, and suffocates, Adriana’s dog in the opening scene. In any other show, this could easily be jump-the-shark territory, but it works because Christopher is trending towards a sad clown archetype. He keeps making the same mistakes, he keeps not learning, he keeps making terrible decisions—yet he continues to be my favorite character. All the signs point toward a grim fate: Christopher has beaten Adriana multiple times at this point and descended into drug abuse. What he has working in his favor is a vestigial promise from the first few seasons. Christopher is the only one of the crew who gets the benefit of sharing his more naïve, innocent, uncynical side with viewers (by virtue of his youth). Lingering sympathy for the young man of season 1 remains even in season 4. What struck me as I re-watched this episode was how the dog’s death parallels Christopher’s death. It’s going out not with a bang, but with a whimper to an absurd degree. Both deaths are unforeseen and anticlimactic, caused by Christopher’s carelessness. Even though he’s an ethical disaster and a lost cause, you hope against hope that rehab and marriage will change Chrissy. But he and Tony are stuck at moral dead ends, trapped in a pointless cycle of doing evil and repenting ad infinitum. Christopher’s intervention distracts the crew from the unspoken fact that Tony killed Ralphie. A guilty conscience prompts Tony to visit Ralphie’s hospitalized son and give money to his mother in an act of contrition. As with Christopher’s rehab, Tony’s act of charity is a long way from making up for his transgressions. The set piece of the episode is the murder of Adriana. By season 5, the viewer’s innocence has been obliterated and there remains no shred of hope that she will emerge from the FBI informant situation alive. In a fantasy sequence that only dupes you for a few seconds (if that), she flees with her red suitcase in the passenger seat. The idea that she could escape unscathed is so outlandish that it is darkly comic—in the vein of the recent fantasy scene in Vice where Cheney retires from public life and lives happily ever after. As Adriana hurdles toward her death, Tony preaches the sanctity of loyalty to his crew. Christopher becomes the focal point of the episode when he must decide between Adriana and Tony. After nearly strangling her to death, Christopher finally takes his hands off of her neck and starts sobbing. I’m of the opinion that Christopher never considered going into witness protection. When he breaks down, it’s because he knows he has to betray Adriana and there is no choice involved whatsoever. The force of his emotion and the transition from violence to despair was akin to the scene in Goodfellas when Karen tells Henry she flushed the cocaine. The ultimate horror is understanding that there is no recourse. 1. Season 6 Episode 21 (finale) "Made in America"
The finale of The Sopranos is probably the most discussed episode of television in history. I think the ending is obvious, but instead of belaboring the final scene, I'll throw my voice into the mix to praise the final lesson. It would be one thing if Tony’s six-season long moral decay was contained to himself, but he acted as an infectious disease, polluting everyone around him. Meadow is Tony’s greatest desecration. He asks why she isn’t pursuing a career as a pediatrician and she says she’d rather be a lawyer to defend Italian-Americans who suffer from stereotypes and prejudice. Meadow’s claim that unfair bias against Italian-Americans explains Tony’s brushes with the law rests uneasily with the audience because we are well aware that Meadow knows what Tony does. Meadow seems steeped in a willful delusion that is even murkier than Carmela’s. A very David Chase-esque, darkly funny twist is Special Agent Dwight Harris’ cameo as an honorary member of Tony’s crew. It’s implied that Harris sleeps with a colleague to get information on Phil Leotardo’s whereabouts for Tony. Then when Harris is told that Leotardo has been killed, he says, “We’re gonna win this thing!” What does it say that Tony managed to corrupt an FBI officer into being one of his soldiers (based on a real story)? Tony engenders a warped sense of morality in everyone he comes into contact with, even when he doesn’t mean to. Tony’s visible sadness that Meadow was corrupted hints that he may have hoped her good works would be his salvation, or at least compensate for his depravity.